Play Sic Bo online for real money at the best online casinos. Sic Bo is a popular dice game where as the player you must guess how the dice will roll. Based on your bet you are paid odds for winning bets ranging from even money to 180:1. See below for the best online casinos for Sic Bo where you can play for real money. If you are unfamiliar with Sic Bo also see below for an explanation of the game and how to play. Use any of the above online casinos to play Sic Bo online for real money. All casinos have outstanding reputations for player and game fairness and all must undergo third party audits to ensure player fairness. Play Sic Bo online for real money at any of these casinos and you can be confident the game is fair and you will be paid when you request a withdraw. Most casinos accept USA players and those who do have outstanding USA deposit options. Sign up at any of our recommended real money online Sic Bo casinos which have great software and offer a great online Sic Bo experience. You can be confident all the casinos are fair and honest and you can expect a great online experience. Sic Bo may look intimidating when you look at the table but the game is actually very easy to learn and play. Sic Bo is played with 3 dice and as the player you bet on how you think the dice will roll. You can bet on a single die, two dice or all three dice and different combinations pay different odds depending on the probabilities of the combination being rolled. To start the game you as the player place chips on the area of the table for the combination you want to bet (similar to roulette). The dealer then shakes and rolls all three dice and pays any winning bets - it really is that easy! The easiest way to learn how to play Sic Bo is by looking at the Sic Bo table. 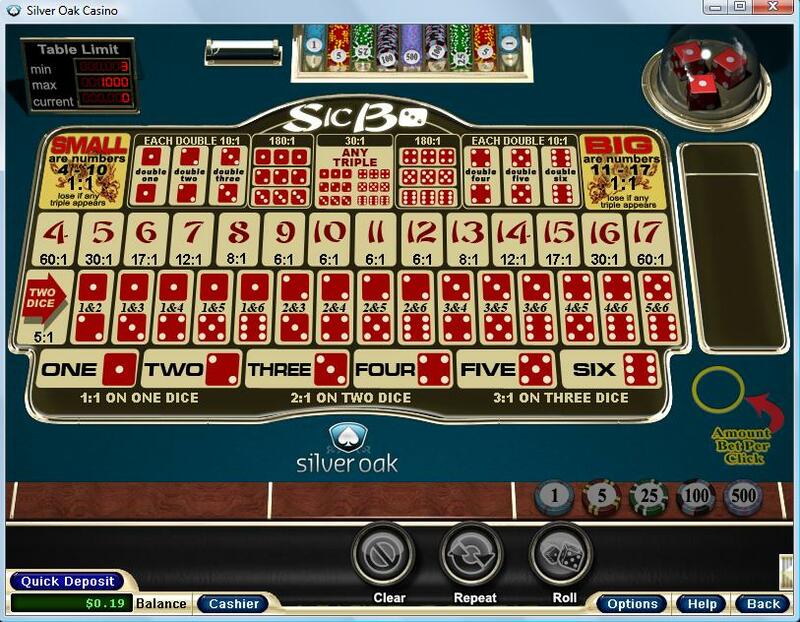 Looking at the Sic Bo table you can see the different areas of the table where you can bet different combinations. A popular Sic Bo bet is the "Small" and "Big" bets which are found in the top corners of the table. The "Small" bet is betting the total of all three dice will equal any number 4 through 10 and the "Big" bet is betting the sum of all three dice will equal 11 through 17. To make these Sic Bo bets simply place your chips in the area of the table for the "Small" or "Big" bets and if you win this bet you are paid even money. Other Sic Bo bets can include betting just 1, 2 or all 3 dice and we will explain each bet starting at the bottom of the table. Across the bottom of the table you will see the numbers 1 through 6 and you can bet if any of the three dice will roll that particular number. When you place this bet, if any of the 3 dice roll your number you are paid even money or 1:1. If 2 of the 3 dice roll your number you are paid 2:1 and if all three dice roll your number you are paid 3:1. For example you bet on the number "5". As long as 1 of the 3 dice roll a 5 you are paid. If one die rolls a five you are paid even money. If two dice roll a 5 you are paid 2:1 and if three dice roll a 5 you are paid 3:1. Above the number line are 2 dice betting combinations. You bet on the combination you think 2 of the 3 dice will roll. For example if you think 2 of the 3 dice will roll a 2&4 place your bet on the corresponding place on the table. If you win your bet you are paid 5:1 for all combination bets. Above this bet you will see the numbers 4 through 17. For this bet you are betting what the total of all three dice will equal. If you think the total of all three dice will equal "9", place your chips on the number "9". Once the dice are rolled you total the dice and that number is the winning bet. These bets pay different odds based on the likelihood they will win. Betting the "9" for example pays 6:1 while betting the "15" pays 17:1. The final type of Sic Bo bets is betting whether the dice will roll a double or triple number. Like other bets you place your chips on the area of the table you think will win. You can bet doubles on 1 through 6 with a winning bet paying 10:1. For example if you think two 5's will be rolled bet the Double 5 for 10:1 odds. You can also bet the dice will roll a triple and bet either all triples (which pays 30:1) or bet the triple combination of triple 1's, 2's or 3's being rolled or triple 4's, 5's or 6's being rolled. When making a triple bet you are given 3 of the 6 numbers that can be rolled. If triple 1's, 2's or 3's are rolled you win. On the other side of the "All Triples" bet you can bet if a triple 4, 5 or 6 will be rolled. Win this bet and be paid a whopping 180:1! Play online Sic Bo for real money at any of our recommended online casinos. Sic Bo is a fun casino game that is easy to play. Make a deposit to any of the above casinos and get started playing Sic Bo online for real money. When making your deposit the casino will most likely offer you a bonus but if you are only going to play Sic Bo you should not claim a bonus. When playing Sic Bo online for real money you should not claim a bonus as Sic Bo play does not count towards earning your bonus. All casino bonuses require a rollover or play through requirement where you must bet your deposit amount a certain numbers of times (generally 20-40x's) before making a withdraw. Since Sic Bo play does not count towards earning your bonus you will be forced to play a different game for real money before being able to make a withdraw if you claim a bonus. If you do plan on playing other casino games other than just Sic Bo the bonus may be worth while to claim, but again if you are only playing Sic Bo you should not claim the bonus. This could be a bad scenario where you win a decent amount of money playing Sic Bo but since you cant make a withdraw until you earn your bonus, you put your winnings at risk by playing other games. Get starting playing online Sic Bo for real money by using any of our links to visit the real money casino of your choice. If you live in the United States look for online casinos listed above which accept USA players. All of our recommended US online casinos for real money do a great job getting USA deposits approved. Make a deposit with your credit card and chances are your deposit will be approved. We made deposits to every USA online casino we list to make sure USA credit cards are approved easily. Make a deposit and enjoy playing online Sic Bo for real money at any of the above online casinos. Good Luck!